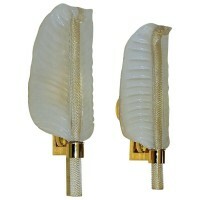 Outstanding pair of large handblown Murano glass leaf or plume shaped wall sconces. The glass is carefully crafted and etched on the back to diffuse light. Finely twisted glass stem has gold inclusions. Mounted on gold plated backplates, each sconce uses 1 – 40 watt base A bulb. Newly wired.